Autumn in Maine: So Much to Fall For! Planning a fall foliage trip to Maine? up or delay the transformation of leaf pigment due to a number of factors. the top destination for leaf-peepers. Maine has more land covered by trees than any other state in the country. 76 tree species, 52 of which are the hardwood leaf-producing variety. follows the Fish River to the historic town of Fort Kent. visit Maine's Historic Parks and Sites. 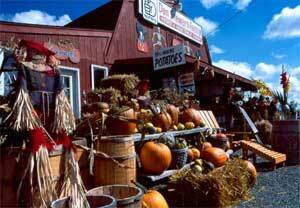 destination, visit Maine's Farms and Orchards. season to answer foliage-related questions. this fall, log on to Visit Maine or call 1-888-624-6345. More information about Maine click here!